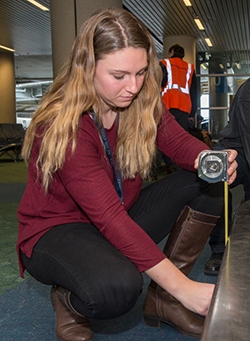 “With my internship at the Port of Portland, I get to help engineers with projects and go on field trips to see the work that we are doing come to life. Some of these projects range from calculating wind loads on a light pole to tracking project changes during the construction process for record drawings. I am currently working on a baggage claim conveyor replacement project. With this project, I got to go up on the catwalks that run along the conveyors that bring the bags from the ticketing counter to the airplanes. I’ve enjoyed the exposure I am getting with these projects and seeing the “behind-the-scenes” of Portland International Airport. The most important thing I have learned with this internship is that everything is a learning experience and if you take the time to ask questions, your experience will be ten times more valuable. If you put yourself out there, there are endless opportunities to learn from people who are excited to share their projects and wisdom with you. I believe internships are a good way to “test the waters” before committing to a career field. There are so many different paths a person can take with their degree and internships allow you a glimpse of future career opportunities. After graduation, I would love to become a licensed engineer. I am unsure of what engineering sub discipline I would like to focus on, but this internship has allowed me to get a snapshot into a wide range of different projects."